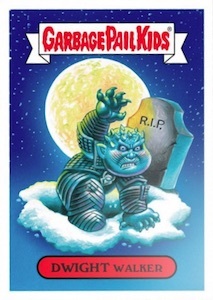 Even the winners are losers with 2018 Topps Garbage Pail Kids Golden Groan Awards! The sticker set takes square aim at the stars of the entertainment world with a limited-time release. Following up the 2017 set, the 2018 Topps GPK Golden Groan checklist is filled with some of the biggest names of film and television, centered, of course, around the Golden Globes. Among the (un)lucky recipients, Margot Robbie earns a spot based on her portrayal of Tonya Harding in I, Tonya. 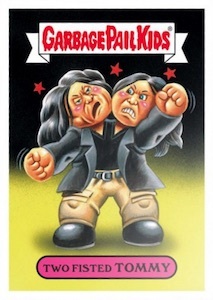 Following rave reviews for The Disaster Artist, James Franco and Tommy Wiseau battle it out for mic time. In addition, "Shape of Walter" naturally pokes fun at Guillermo del Toro's Shape of Water, while the undead from Game of Thrones get a shoutout. Unzipping his Winston Churchill mask, Gary Oldman reveals himself in Darkest Hour. 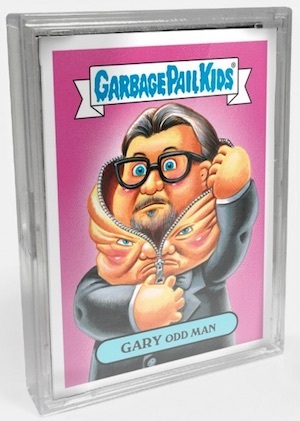 Sold on the Topps site for just one week, 2018 Topps Garbage Pail Kids Golden Groan Awards goes for $29.99. 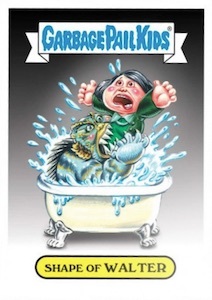 That price includes all 12 sticker cards in the set with two different listings for each GPK drawing. 6 images and 12 total cards. Shop for cards on Topps.